I’ve been spending the week visiting my sister in San Francisco and no trip to the bay area is complete without a visit to our favorite sci-fi/fantasy bookstore, Borderlands. 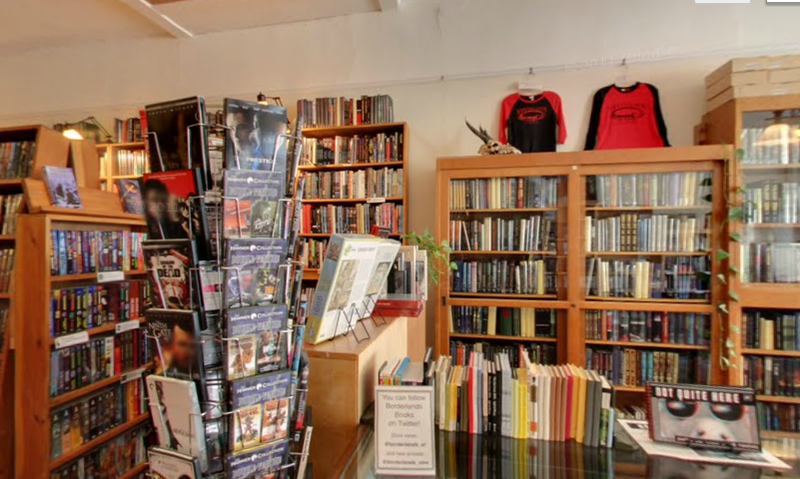 It’s actually one of the only sci-fi/fantasy bookstores I’ve ever encountered in the states (the runner-up for best sci-fi/fantasy bookstore in the world is this Swedish bookstore with locations in Stockholm and Gothenburg), but regardless of its rarity, its excellence is without question. The bookstore is well-stocked, well-organized and superbly-curated. Without fail, after each visit I have come across at least one book that I have been unable to find anywhere else. This time I was particularly impressed with the quantity of anthologies published by Terri Windling and Ellen Datlow (two brilliant editor/writer/artists who I have just had the pleasure of discovering in the last six months and who are slowly changing my life book by book) and several books by Delia Sherman that I was convinced were out of print. Time passes in strange ways inside Borderlands—hours go by in what seems a matter of minutes—and it’s always difficult not to emerge from the store with several pounds of books. I tried very hard to restrain myself so as not to have to fly home with an additional suitcase, but two books I did pick up were The Privilege of the Sword and The Fall of the Kings by Ellen Kushner. I just finished reading Swordspoint, the first in this inter-connected series of books, and I experienced that frenzy of joy unique to discovering a new author I feel I’ve been waiting my whole life to read (expect a review of this book very soon). Not only does Borderlands host a wide range of events, but the bookstore is home to Ripley, a friendly and appropriately exotic-looking hairless or Sphynx cat. Adjacent to the bookstore is a spacious and comfortable café with excellent coffee and snacks where one can sit and begin immediately devouring all purchases. After buying as many books as we could stuff into our bags yesterday, my sister and I did just that. Greetings from Florida! I’m bored to death at work so I decided to browse your website on my iphone during lunch break. I love the information you present here and can’t wait to take a look when I get home. I’m amazed at how fast your blog loaded on my phone .. I’m not even using WIFI, just 3G .. Anyhow, very good site!